USS Little (APD 4), Commander Hadley’s flagship at Guadalcanal. 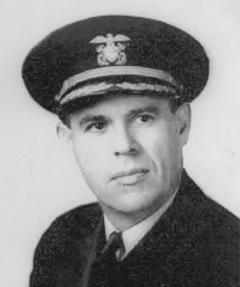 Commander Hugh William Hadley, USN. Hugh William Hadley was born 17 February 1901 at Moro, Oregon, and was appointed to the naval academy in 1918. Commissioned ensign 29 May 1922, he served on board many ships, including Pennsylvania and S-27, and various shore stations in the prewar years. After serving as executive officer of Roper 1936–1939 and in Maryland 1941–1942, he was promoted commander and assigned to command Transport Division (TransDiv) 12, ex-flush-deck destroyers Manley, Colhoun, Gregory, Little, McKean and Stringham in the Pacific. When supplies for Marines newly-landed on Guadalcanal were disrupted following the Battle of Savo Island, 9 August 1942, Hadley's high-speed transports were assigned to make nightly runs. On 30 August, Colhoun was sunk by aircraft. On 4 September, Little, with Comdr. Hadley embarked, and Gregory transported a detachment of Marines to Savo Island on an rumor that enemy forces had occupied it. Finding no opposition, the troops were returned to Guadalcanal but as that night was unusually dark, Comdr. Hadley decided to remain on patrol off Lunga Point rather than attempt to negotiate the entrance to nearby Tulagi Harbor without navigation aids. At about 0100 on 5 September, Little observed gun flashes to the east, which she believed to be from an enemy submarine. Moments later, a Navy Catalina flying boat released a string of fire flares to illuminate the source of the flashes, which it also thought was a submarine. Instead, the flares illuminated the two APDs for Japanese destroyers Yudachi, Hatsuyuki, and Murakumo, which had not previously detected them. In the ensuing one-sided battle, Little and Gregory opened fire, but were quicky overwhelmed. The Japanese closed the battle by steaming between the two sinking ships, strafing survivors. Comdr. Hadley was among those lost. He was posthumously awarded a Silver Star for his outstanding performance in the Solomons Campaign.